Great Gerbil ~ Rhombomys opimus. 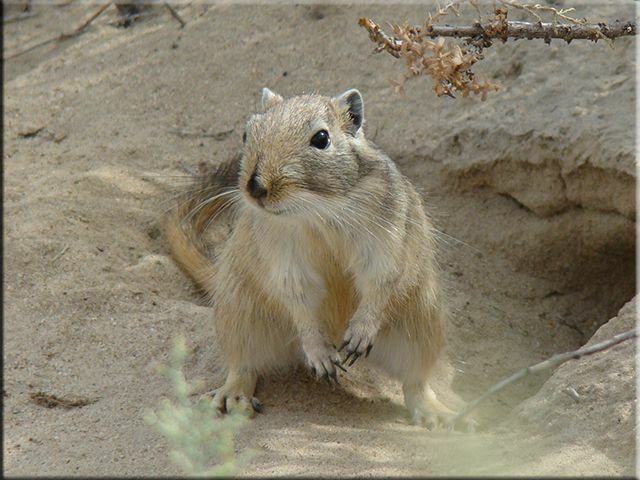 First described by Lichtenstein in 1823, and regarded as the largest of all the gerbil species. With a head and body length between 15-20cm (6-8in) and a tail of similar length. Their incisors are also quite distinct; having two easily distinguished grooves in the teeth. The animal claws are designed for heavy duty burrowing, and is reflected in their extensive burrow systems. This particular species is very wide ranging and populations can be found in Iran, Central Asia, western Southern Asia, China and Mongolia. 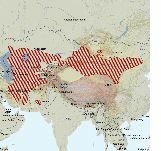 It is also widespread in Iran, Turkmenistan, Uzbekistan, Kazakhstan, and appears to have a smaller distribution in Kyrgyzstan and Tajikistan. In Southern Asia, it has been recorded from northern Afghanistan (Habibi 2004) and western Pakistan (Baluchistan) (Molur et al. 2005). In China the species is also very widespread, and has been recorded from Xinjiang, Nei Mongol, Gansu, Ningxia and western Gansu (Smith and Xie 2008). In Mongolia, it has been recorded from desert and semi-desert habitats across southern Mongolia, including the Dzungarian Govi Desert, Trans Altai Govi Desert, Alashani Govi Desert, Northern Govi, and Eastern Govi. Shargyn Govi in southern Govi Altai Mountain Range represents the northern limit of its range in Mongolia (Mallon, 1985). Approximately 35% of the species’ range in Mongolia occurs within conservation protected areas. The great gerbil is described as being diurnal, fossorial and colonial and is often seen associated with other great gerbils, and many individuals can be found occupying a single burrow system. In China, the species occupies desert to semi-desert habitat, and is most successful in dry river beds dominated with shrubby vegetation (Smith and Xie 2008). In Southern Asia, it has been recorded from apple orchards and clay-sandy embankments. It has been found to occupy steppe mountains and upland deserts and sand dunes with scattered vegetation, in Southern Asia (Molur et al. 2005). Distribution is always associated with the presence of saxaul plants (M. Stubbe pers. comm.) and their diet consists mainly of plant matter. They are well known as crop pests and can cause considerable damage and also exascerbate erosion. The entrances to their burrows are large constructs and lead to an extensive and often very elaborate burrow system that consists of long deep tunnels, with separate nest and food storage chambers (Smith and Xie 2008). Shar, S., Lkhagvasuren, D. & Molur, S. 2008. Rhombomys opimus. In: IUCN 2010. IUCN Red List of Threatened Species. Version 2010.4.